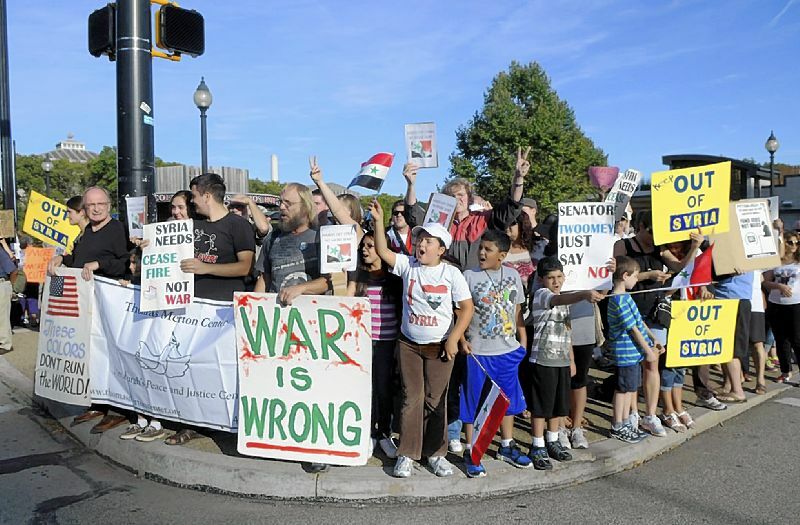 Robin Rombach/Post-Gazette: Protesters gather Friday on the corner of Bigelow Boulevard and Forbes Avenue in Oakland in disapproval of possible U.S. military action against Syria. 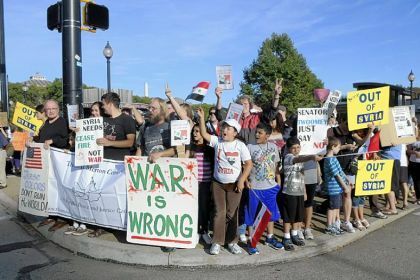 Sept 7, 2013 - Weary of nearly two decades of intermittent wars in the Middle East and Afghanistan, protesters met in Oakland on Friday to tell the Obama administration not to bomb Syria in retaliation for its apparent use of chemical weapons in a Damascus suburb last month. Chanting slogans such as "more money for jobs, not for war!" and waving signs with slogans such as "Obushma" and "These Colors Don't Run the World," the group of approximately 100 demonstrators organized by the Thomas Merton Center Antiwar Committee clogged the intersection of Forbes Avenue and Bigelow Boulevard and repeatedly crossed the streets in front of stopped vehicles. Among them, Syrian native Elaine Khalil, 47, said the United States -- and all the other countries trying to influence the outcome of the conflict between Syrian President Bashir Assad and the rebels trying to oust him -- should stop meddling and let the Syrian people make their own peace. "With [President Barack] Obama supporting this war, our fear is it would actually explode into World War III," Ms. Khalil said, citing the possibility that military strikes might incite retribution by other countries in the region. "If they would pull their hands out of it, the Syrian people would resolve their own problems." The administration's push to retaliate against Syria stems from an Aug. 21 sarin nerve gas attack in Ghouta, on the outskirts of Damascus, that some reports have said killed as many as 1,700 people, including approximately 400 children. In 2012, Mr. Obama said Mr. Assad's use of chemical weapons would be "a red line for us" that could prompt military action. Watching the protest from across the street, 18-year-old Syrian native Laila Al-Soulaiman said the conflict in her home country is too complicated to be the subject of a protest, and that resolving it is not a simple matter of supporting one side over the other. As a Syrian, she said she supports intervention by the United States, but not military strikes. She doubts that the United States will act at all, though, since the Syrian conflict began two years ago and chemical weapons have been used there for at least a year. "If the Obama administration had any intention of helping the Syrian people, they would have done that two years ago," said Ms. Al-Soulaiman, a freshman political science major at the University of Pittsburgh. "The 'red line' has been crossed a year ago, and now it's Obama trying to save face." Daniel Freer, a 20-year-old Pitt bioengineering student from North Carolina, said he attended the demonstration to show he wants the United States to stay away from yet another potential military quagmire. The Obama administration's talk of military strikes as punishment for the sarin gas attack, he said, reminds him of the Bush administration's false claims of "weapons of mass destruction" as justification for going to war in Iraq, however different the circumstances. "I know if we go in, we'll be there too long, or do it the wrong way, and it will be pointless," Mr. Freer said. Amy McConnell Schaarsmith: aschaarsmith@post-gazette.com or 412-263-1719.